Choosing an engagement ring, or any diamond ring, is exciting. A diamond makes anyone feel special. When choosing a diamond, however, there are some important features to consider besides how much it sparkles. The four most important aspects of diamonds are the 4C’s: Color, Clarity, Cut and Carat Weight. It is helpful to educate yourself in these four areas before you go shopping for a diamond. Russell & Ballard is here to assist you with any questions that you may have regarding your diamond purchase. 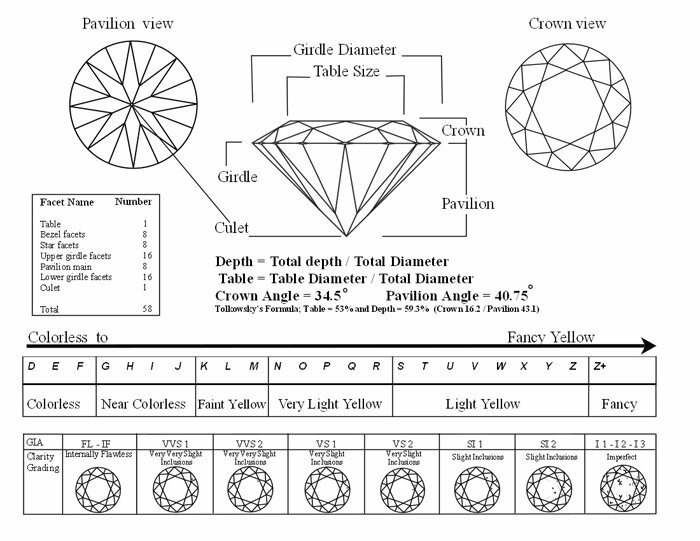 Diamonds range in carat size . Carat is a personal preference and also depends on your budget. *Note: Any grade “SI2” or above has inclusions that are “eye clean”, not visible to the naked eye. An “I1” grade can be an excellent value, particularly if the inclusion is on the outer edge. “I2” grades can still exhibit a fair degree of fire and light. “I3” grade diamonds are noticeably more opaque or dark to the naked eye. More than any other attribute, it is the Cut that makes a diamond brilliant and beautiful. A diamond that is well cut reflects light internally and displays a dazzling shower of light back through the top of the stone. A poorly cut diamond will leak light out of the bottom and sides. Symmetry is another important factor in the brilliance and beauty of a diamond. A diamond is like a small house of mirrors. If the facets are lined up properly, the diamond returns more light to the viewer’s eye. Finally, a diamond that is well Polished will reflect more light and sparkle from the surface to the viewer’s eye. Cut, Symmetry and Polish are rated on your diamond certificate from Poor to Excellent.